Drive in the Dream Rally! 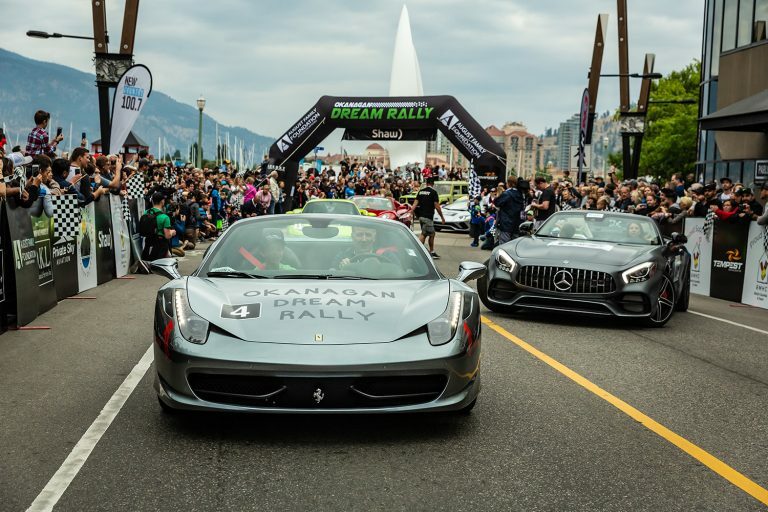 Are you ready for the 4th annual Okanagan Dream Rally? Join us as we surpass our $1,000,000 goal this year! In just 4 years, the August Family Foundation has raised $827,000 for charity, and we are excited to reach our 5 year goal of One Million in 2019. If you wish to register and drive your vehicle in the 2019 Dream Rally, use the form below to get started. 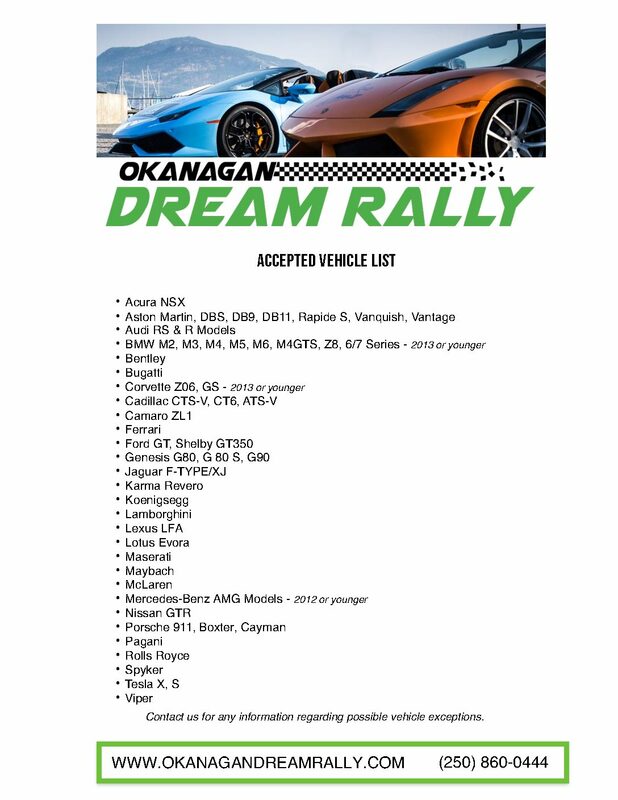 Proceeds from registration fees and sponsorship costs will go towards money raised from the Okanagan Dream Rally. Please note that due to the nature of the event, all drivers will be required to complete a free criminal record check prior to participating. Instructions will be emailed with registrations. There is an option to add on tickets to our Launch Party at the bottom of this form. Includes (2) tickets to our Launch Party ($100/ticket value). Vehicle sponsorship will have priority placement on vehicles near the front of the rally. • Vehicle sponsorship includes decals of your company on the vehicle hood and doors. • Sponsorship is a great opportunity for your company to gain branding exposure. • Please note: If you do not sponsor your vehicle, you are not responsible for finding your own sponsor. One will be assigned to your vehicle. • At the bottom of this form, drivers are welcome to add-on tickets to our Dream Rally Launch Party! You can select your registration option in the form below. * Please note: A copy of driver's license & complete vehicle registration must be provided to finalize registration. A legible photo of each is acceptable. You can also submit these in person to August Luxury Motorcars if you prefer. See here for a list of eligible vehicles. Note: If you would like to register more than one vehicle you will need to register each vehicle separately. The registration fee is waived with vehicle sponsorship. If you sponsor your vehicle, it will be decaled with the company you specify. Please note: If you do not sponsor your vehicle, you are not responsible for finding your own sponsor. One will be assigned to your vehicle. * Please attach a high resolution vector file of your company logo. If you do not have it available at time of registration, please email it to [email protected] at your earliest convenience. Ensure you don't miss any important news or Dream Rally updates! I permit the Okanagan Dream Rally to use any and all photos of the vehicle and/or driver for future event promotions. As a Rally Driver/Vehicle Owner I understand that the August Family Foundation will provide me with a child or youth passenger for the Okanagan Dream Rally. As a Rally Driver/Vehicle Owner I understand that my highest priority is the safety of my child or youth passenger on the road. As a Rally Driver/Vehicle Owner I am allowing August Luxury Motorcars to decal my vehicle with a sponsor that either provided or agreed upon. Due to the nature of this event, we ask that all vehicle registrants pay a registration fee of $450, waived if you choose to sponsor your own vehicle. By typing your full name below, you agree to the terms and conditions. Click here for Launch Party details!